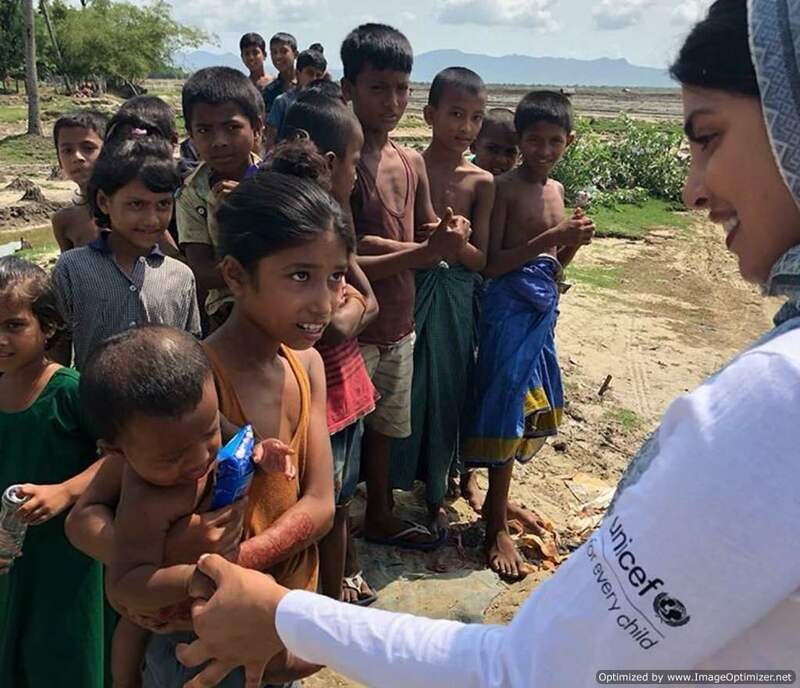 After attending the Royal wedding of her friend Meghan Markel in London, Actress Priyanka Chopra soon headed to United Nations Children’s Fund’s (UNICEF) field trip to Bangladesh to meet Rohingya refugees. Having met the Syrian kids in Jordan last year, The Quantico actress this time visited Kutupalong, a refugee camp in Cox’s Bazar (Bangladesh), which is one of the largest refugee camps in the world. In one of her photos from the trip, she can be seen wearing UNICEF T- shirt and indulging in conversation with the children. While describing the horrific overcrowded condition of the camp she also urged her followers to support the good cause of UNICEF, “Follow my Instagram to share my experiences as I visit the Rohingya refugee camps on this UNICEF field visit. Children uprooted, the world needs to care. We need to care,” she captioned one of her image. Ever since her association with UNICEF in 2010 and 2016 respectively, the leading lady of Bollywood and now of American TV Priyanka has been supporting many noble causes including girl empowerment, child education and child marriage and others for a decade now. On work front, she will be next seen in ‘A Kid like Jake’ starring Claire Danes and Jim Parsons. In Bollywood she will soon start filming for Ali Abbas Zafar’s ‘Bharat’ along with her co-star Salman Khan. Previous story We Can’t Believe That These Hotties Are Mothers of Bollywood Actresses.